In some respects football is all about timing; when to play a pass, when to shoot, when to step up to catch an opponent offside. It is also about when to challenge for a header or the right moment to slide in and dispossess the opponent. In the case of heading and tackling, these are two aspects of the game where technical ability can mean the difference between success and failure. They are also aspects of the game where a lack of technique can leave either or both players nursing an injury. So many situations during a game of football are decided by fractions of a second. And those fractions of a second can mean the difference between making contact with the ball, or making contact with the opponent. The consequences of the latter are all too obvious, and can differ by degree depending upon the force of the impact. Not surprising, there are some incidents of this nature that are all too deliberate. Any football watchers, either from the sidelines at a local Sunday league game or from the stands at a top-class game has witnessed and recognised a challenge whose aim was to injure an opponent. However, the vast majority of physical clashes that result in injury are accidental. Good decision making and timing should be taught from an early age. This does not have to be in the form of intensive coaching. The most important lesson young players need to learn is commonsense. It is when match play becomes faster and more intense that, for example, the art of making a good tackle requires a greater degree of expert input. Keeping the eyes on the ball rather than being distracted by the movement of the opponent is a good basis from which to start. This is a discipline that should be instilled in players as soon as possible; as is stepping in to “nick” the ball from opponent’s feet rather than taking dramatic swings of the leg that are more likely to make contact with flesh and bone than the surface of the ball. 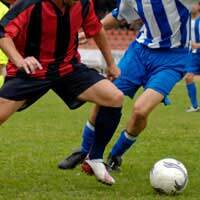 Another skill that can reduce the risk of injury is “trapping” the ball with the feet or another part of the body, such as the thigh or chest area. Should a player let the ball run away from their feet, they are inviting a challenge. And the more they let the ball run loose during a game, the more challenges they are going to be involved in. The same principal applies to good passing: the less accurate a pass to a team-mate is, the more likely an opponent is to challenge - the poorest passes are referred to as “hospital balls” for a very good reason. The aim of good technique is not to negate the physical aspect of the game of football; rather it will ensure that “clean” contact is made, allowing each opponent to use their aggression in a controlled manner to challenge for the ball. Ultimately, when the final whistle blows, both sides should shake hands in the knowledge that it has been a hard fought but fair game. good information for semi professional footballers.